I'm sure this is old news for a lot of you, but the past few months I've been purging my house of unnecessary crap: books that will never get read again, magazines that were being held onto for a single recipe or article, old clothes, random boxes, dusty trinkets and knick knacks, CDs from the 90s (Much Dance, anyone? ), small appliances that we thought we could fix but never did and have long since been replaced...you know, the junk that gets shoved into the back of closets, cabinets, storage rooms, and whatnot. Brett and I did a major purge back in September and it was absolutely amazing how much our stress levels went down (who knew the junk we rarely looked at could cause so much stress?) and how much happier we were as a result of it. Since then we've been slowly purging more things, like the honking huge entertainment center that we had in our living room that housed the massive (in weight and dimension, but not in screen size) tube TV, which we also got rid of. We didn't realize just how much room this entertainment center took up until we got rid of it and we're amazed as to how much space we got back in return. Our living room looks so much bigger now! It's going to be quite a long while before our place can be considered "clutter-free" and we realize that our purging is going to be a complete ongoing process. We have become way more aware now about what's coming into the house and have been careful about not creating new clutter. We have to constantly remind ourselves that just because we got rid of a lot of crap it doesn't mean that we can bring in more. If the item doesn't have a spot in our home it will always be out of place and therefore will always be clutter. Well, I've also been thinking about purging something else...my stash. I guess you saw that one coming, didn't you? But not my entire stash, oh hells no! Just really going through it with a fine tooth comb and being realistic with everything that I have. I'm thinking of it as culling the herd, which I'm sure is a term that a lot of you who are on Ravelry have probably been hearing about quite a bit recently. 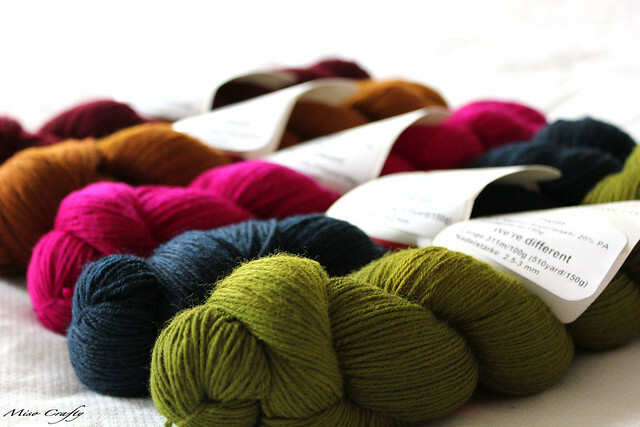 Another term that's been floating around the knitting-sphere a lot lately: SABLE. For those of you not in the know, SABLE stands for Stash Acquisition Beyond Life Expectancy. It's a term that the Yarn Harlot coined (she's so brilliant!). I think I'm slowly reaching that point. And it scares me. But hey, it could be worse. Much, much worse. I mean, check out this knitter's stash here. Definitely the world's biggest stash! I am no where near that! Having a stash like that would definitely overwhelm and stress me out. To the max. But let's just say that I have enough sweater quantities of yarn in my stash to knit a sweater a month...for the next ten years. I wish I was kidding, but I am not. And that's not even counting the single skeins that could be turned into socks, shawls, other accessories, and possibly striped pullovers. Yikes! A bit scary. I know. And I still have more yarn coming my way as I'm still involved in a few yarn clubs. I really hope you don't think I'm bragging here by telling you the extent of my stash, I just want you to know the absolute seriousness of my need to get ahold and to try to get my stash under control. Last month I've spent quite a bit of time trying to organize, assess, and catalogue all my yarn. It's a long process cause I'm still trying to take photos, still adding more to my Ravelry stash page, and I still find the random skein of "lost" yarn in the closets! But I'm getting there. Slowly, but surely. I'm sure this need to wrangle the stash is the biggest reason why I'm having this bout of Starteritis. Aside from wanting to cast on every single project I want to knit this year (luckily I haven't...yet), it's like I must.use.up.as.much.yardage.as.possible. Now. So how am I culling the herd? Well, besides following the rules I have laid out for myself in my Stashdown plan, I have made (careful) lists of yarns that can leave the stash. Yarns that I have no plans for and that I have fallen out of love with, yarns that have value and can therefore be traded, yarns that I'm willing to cut up into mini skeins, yarns that I can destash, and yarns that I love but have already made a project out of and only have the solo skein leftover but know of someone who could give it more love than I currently can. It's interesting to actually go through your stash, to sit there and handle each and every skein. I don't know if this happens to anyone else, but each skein that I touched I could immediately see what it would ultimately become. Yes, there are batches of yarn that were bought for the same pattern. Yes, there are yarns that were meant for certain patterns that I have fallen out of love with but can now see in a different design. Yes, I realized that the majority of my stash was purchased with an actual project in mind. And yes, that's why I'm finding it just a little harder to put some yarns into the destash bin. I think trying to purge my stash will be another ongoing process cause I really do love about 90% of what I have. Anyone else culling their stash? And possibly having just as hard of a time as I am? I think I better go think this over some more...while knitting as fast as I can! No, I think everyone has their meh section of the stash. As weird as it may sound, I kinda don't even want to get rid of the meh yarn since some of it does have a purpose...like to become dishcloths and such. That one knitter's stash, if it were mine I think I wouldn't like knitting any more. Cause really, where would you even start?? btw i love how the comment form says "please prove you're not a robot". I think I definitely need to cull my stash. I have a list of little projects I want to do to use up some of my smaller lots of yarn. I have also put myself on a yarn shopping ban till the stash is at least halved. Kat, you have a ton of discipline though! I've seen the last time you were stash busting and you did such an awesome job and had such restraint on not buying more yarn! I have a lot of smaller lots of yarn, leftovers, that I have NO idea what to do with. I guess I'll be patrolling the webs to find ideas and projects! No worries Nat! You know that when I make final decisions that I'll most likely will be bringing a box to knitting for you guys to take a look at first!